How do you choose a power bank that you can always count on?. Capacity: 16750mAh. - 1 RAVPower RP-PB19 Power Bank. What's in the Box. Xiaomi Mi3, Mi4, Mi Note. QC 3.0 & 2.0 Compatible Devices HTC One M9 / M8, HTC Desire Eye, HTC One remix. ZTE Axon Pro, Yota Phone 2. Charging Simultaneously with 4 USB Port. Samsung Galaxy S7/ S7 Edge S6/ S6 Edge/ Edge Plus, Note 5/ Note 4/ Edge. Dual USB interface. Modified ItemNo. Color: Black. Manufacturer warrantyYes. Power: 5W/10W. Output Current 1A 2.1A. How do you choose a power bank that you can always count on?. Capacity: 16750mAh. - 1 RAVPower RP-PB19 Power Bank. - 2 USB to Micro USB cables (Lightning cable and type-C cable are Not included). USB A1: 5V/ 2.4A max, USB A2: 5V/ 2.1A max. Specification: Capacity: 16750mAh Input: DC 5V/ 2A (Standard Micro USB Port) USB A1: 5V/ 2.4A max, USB A2: 5V/ 2.1A max Note: 1. What's in the Box: - 1 RAVPower RP-PB19 Power Bank - 2 USB to Micro USB cables (Lightning cable and type-C cable are Not included) - 1 User Guide - 1 Travel pouch. POWERADD - Pilot Pro 2. POWERADD- Power Your Life. 23000mAh of power keep you and your gear from drying. 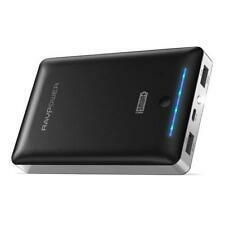 Capacity: 23000mAh. Ultra-High Capacity. Input: Input: DC 12~24V/2A. DC Output: 9V/12V/16V/19V/20V 4.5A(MAX). Xiaomi Mi3, Mi4, Mi Note. 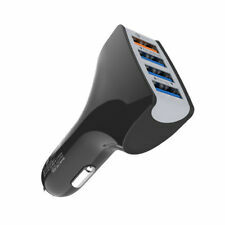 QC 3.0 & 2.0 Compatible Devices Charging Ports:4 USB. Sony Xperia Z/ Z4 Tablet, Z3/ Z3 Compact/ Z3 Tablet Compact. Samsung Galaxy S7/ S7 Edge S6/ S6 Edge/ Edge Plus, Note 5/ Note 4/ Edge. Trending at C $5.38eBay determines this price through a machine-learned model of the product's sale prices within the last 90 days.